Kinesiology Taping is the revolutionary new injury prevention and rehabilitation technique taking the world of professional sport by storm. If you're reading this you're probably familiar with how it works, but if not check out our handy blog - Kinesiology Taping: What's It All About? Find a marker that elicits the problem or pain you want to tape. If this taping is done right it should give an instant improvement in this marker. It could be something specific like an empty can or grip strength test. Where possible I try to use something simple and functional like a squat, sit to stand or arm elevation. This way both you and the patient can see and appreciate the change. The mantra is; Test. Tape. Test again. Make sure the area you want to tape is clean and dry (oils, creams, sweat etc all stop the tape from sticking well). If hair is thick enough to prevent tape adhering well shave the area first. This simple 2 strip taping is a great way to reduce pain and improve regional function. It can be used almost anywhere on the body to help a whole bunch of problems from tennis elbow to plantar fasciitis. Cut a shorter strip (Decompression). About 10-20cm depending on the size of the body/ area you want to tape. Round the ends of each tape. This is not cosmetic, by removing the sharp angles it helps to tape to stick longer. Stretch the tissue in the area you want to tape as much as possible. Always lay the first and last 3-5cm of tape with no stretch at all. Rub the tape all over before you start moving about to activate the glue. Always curve the ends of the tape. Never put any stretch on the ends of the tape. Give yourself plenty of time to plan, cut and stick with precision. 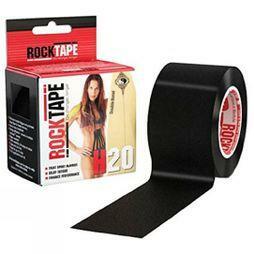 Keep your taping fairly simple. Try not to handle the glue side of the tape. Take time to carefully rub the tape ALL over to ensure the glue is activated and the tape sticks well. TEST. TAPE. TEST AGAIN. If the tape makes no difference, be prepared to remove it and try again. 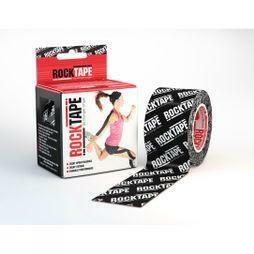 RockTape UK Medical Director Paul Coker gives us the lowdown on the injury prevention and rehabilitation technique taking the world of professional sport by storm.